This Whidbey Island and Deception Pass tour from Seattle highlights the best of Washington State's famous scenery and lifestyle. Washington’s largest island is packed full of local charm, friendly people, state history, and beautiful vistas. Among the most popular weekend destinations for locals, Whidbey enjoys an idyllic setting and playful energy that make it a rewarding day trip from Seattle. The tour includes a gourmet lunch, park admissions, and pick-up/drop-off at your Seattle hotel in our luxury Mercedes van. Our Whidbey Island and Deception Pass tour begins with morning pick-up at your hotel in our eight-passenger Mercedes van. On the way, we'll enjoy coffee, tea, and pastries while taking in picturesque Pacific Northwest scenery. During the ride, your guide will discuss the fascinating history, culture, and geology of the region. We’ll start our day at the island’s most stunning natural attraction and its only bridge to the mainland: Deception Pass. Strong tidal currents shape the dramatic landscape to this day. The beautiful vistas and beaches demonstrate why this is the most visited park in all of Washington State. Our next stop is Coupeville, one of the oldest communities in Washington and one of the centerpieces of Ebey’s Landing National Historic Reserve. The site was chosen for its abundant farmland and promising sea access by Captain Thomas Coupe, who homesteaded the area in 1852. Today, it’s a cute town packed with charm, shops, and history. While we're in town, we'll enjoy lunch at one of our favorite local restaurants. After lunch, we’ll head to the windswept cliffs of Ebey’s Landing National Historical Reserve, an excellent location to discuss the colorful history of European and American settlement of Puget Sound. 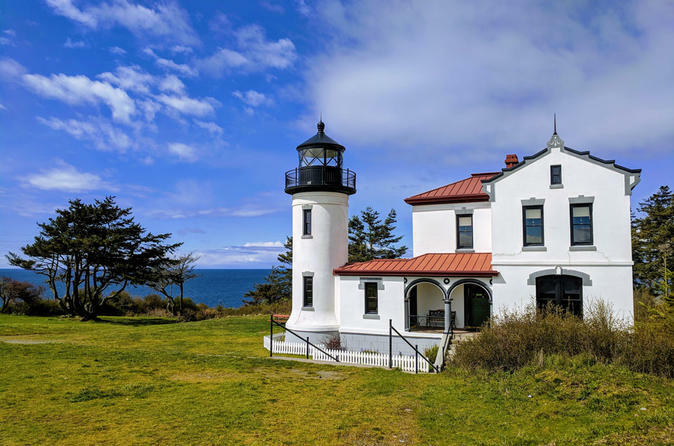 We'll also visit Fort Casey, a former military installation, where we'll wander the abandoned bunkers, visit the beautiful historic lighthouse, and enjoy sweeping views of the Salish Sea. Finally, we’ll round out our tour by visiting beautiful downtown Langley. Soak up the creative and small-town island vibe as your guide shows you around town. If you like, stop into the boutique shops and small art galleries lining the main street. We'll finish the day with a scenic Washington State Ferry ride back to the mainland. On the comfortable ride home, relish the memories and photographs from a great day. Hotel pick-up/drop-off, ferry fare, park admissions, and food and drink are all included. Please note that our guides optimize every tour based on the season, weather conditions, and guest interest, so exact stops are subject to change.